While many plumbing companies provide drain cleaning services in Denver and the surrounding areas, finding one that offers quality services requires a little research. In addition, engaging a reliable and reputable company offering efficient, safe, fast, and friendly services is important since it will ensure you have a stress-free experience. Our $68 drain cleaning coupon is "The Real Deal" here in Denver and only available with the coupon displayed on our website! For $68, with a regular price of $199, we will send one of our clean cut, highly qualified drain cleaner technicians to your home and fix your drain problem right the first time, guaranteed! Call (303) 993-1406 or contact us here to schedule now. 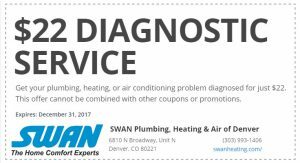 With our established history of providing high-quality services in Denver, you can be sure you are in good hands with Swan. As such, you should not worry even when you are in dire need of drain cleaning services. Swan offers practical drain cleaning solutions in Denver and surrounding areas. As the leading home comfort experts in Denver, we also provide high-quality and competitively priced drain cleaning services every hour of each day. Assistance is, therefore, available whenever you are in need. As you may well know drain cleaning emergencies can occur at any time. As such, opting for a service provider open to serving your needs even during weekends and holidays is recommended. As a drain cleaning service provider, we have a reputation for prompt responses on top of high-quality and reliable services in Denver and the surrounding areas. When it comes to drain cleaning, bathrooms often present a different set of challenges, from sinks filled with grime to bathtubs and showers clogged with accumulated hair and soap. Additionally, toilet paper and any other item that is thrown down toilets can at times overwhelm the drains. As a professional drain cleaning service provider, we at Swan have the necessary expertise and equipment to solve each of these challenges. Although floor drains can also be found in patios, driveways, garages, and bathrooms, they commonly occur in laundry rooms and basements. Floor drains feature a trap filled with water to prevent sewer gas and other foul odors from escaping. Although dirt and debris often clog floor drains, we have the expertise and equipment required to unclog floor drains quickly and restore proper drainage. Downspout drains are helpful when it comes to channeling the water coming from your roof gutters away from the house. Many downspouts connect to the city's storm sewer system through underground pipes. Unfortunately, leaves and debris often clog these connecting pipes, which usually causes a backup. Our professional plumbing services include cleaning downspouts and the connected pipes to prevent flooding and restore proper drainage. Over time, kitchen drains can run slower or block as grease, soap, fat, and detergents build up inside the pipes, particularly on the tubes’ inner walls. In such cases, our service technicians specialized in kitchen plumbing use a sink machine to remove all debris and cut through the clog. Swan Plumbing, Heating & Air is a highly reliable drain cleaning service provider comprised of a qualified and experienced technical team. Having provided high-quality services to the residents and businesses of Denver and its surrounding areas for quite some time, each of our technicians has more than five years’ experience in this industry. Our staff consists exclusively of highly experienced, dedicated, and professional drain cleaning personnel and technicians, a fact that enables our ability to provide comprehensive and reliable services. On top of quick responses, emergency services, and upfront pricing, we provide all our customers a written and signed guarantee to back up our services. In addition to the fact that our entire staff comes highly recommended in Denver and the surrounding areas, we also offer comprehensive drain cleaning services to all our customers. With advanced technological knowledge, state of the art equipment, upfront pricing, and quick response, engaging our drain cleaning services is your best option. To ensure we provide reliable, high-quality, and satisfactory services to all our clients, our well-trained technicians use technologically advanced equipment when cleaning drains. To ensure we provide high-quality and trustworthy services on every given project, every member of our staff undergoes continual expert training to acquire advanced and up-to-date skills and knowledge related to drain cleaning. When it comes to drain cleaning, our customers deserve friendly, prompt, trustworthy, and high-quality services, which is why we continually train our entire staff to work on a wide variety of drainage issues. We also make sure we are adequately and ideally equipped to quickly diagnose the problem and perform the services required to restore optimal functionality. At Swan, satisfying our clients and ensuring they all have a stress free experience is our priority. In Denver, the Swan name is synonymous with high-quality services backed by years of experience. Apart from cleaning and unclogging your drain, we will provide tips and recommend a maintenance product to ensure your drains continue flowing freely. As experts when it comes to drain and sewer line issues, we can also help you with kitchen leak repairs and provide advice on how to maintain your plumbing system and prevent such damages. Contact our honest and friendly customer care personnel if you have any drain cleaning issue, be it slow bathtub drains, clogged shower drains, plugged toilets, backed up floor drains, or sluggish kitchen sink drains in Denver and the surrounding areas. Our advanced knowledge and expertise, 24-hour availability policy, as well as mobility and ability to access every part of Denver and its surrounding areas is a guarantee that regardless of time, we can provide the assistance you require even when it is an emergency.